Drumm and Doom have drawn a line in the sand battle the combined force of earth’s magical beings and users under the thrall of Doom. Drumm is subjected to the penance stare of the ghost rider and Doom retreats. 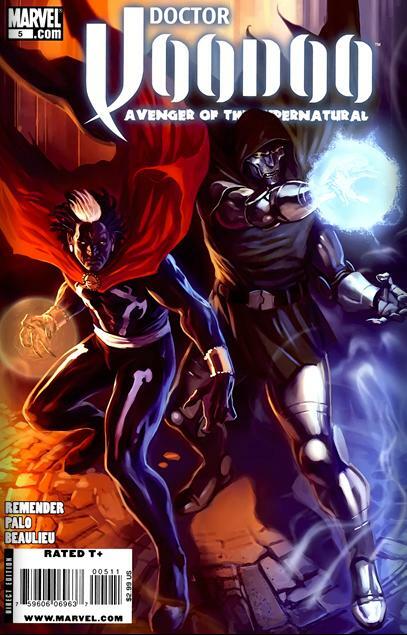 Using the book of Vishanti they formulate a plan using Drumm’s ghost brother and his possession of Ghost rider. Once they have him they get a device from doom that will make Nightmare tangible. The plan works and the defeat him. 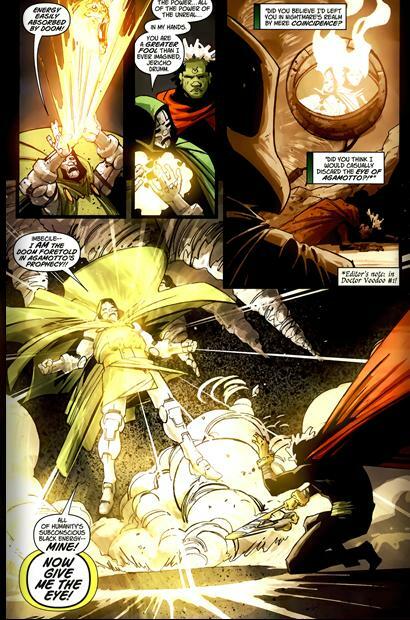 Dr. Doom predictably betrays them and absorbs Nightmare and his powers. 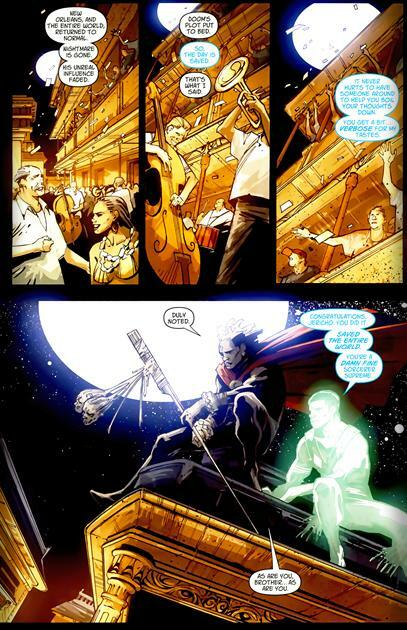 He reveals leaving Voodoo in the nightmare realm was all a carefully orchestrated plan so he could become sorcerer Supreme. Damon takes control of him and throws Nightmare into the Bondye realm, ending the threat. Doom cast out Damon’s spirit and vows that he will have his revenge for this affront. Voodoo binds the Door once more this time with the crows of Legba. The world is restored and the Drumm brothers celebrate. Only one thing remains uncertain….if the threat warned by the vishanti was Doom? or something else? One of the women helping Voodoo with his charity house comes to carry him on a date and he accepts. In the Bondye, Ogoun is approached by his servant as he feeds on Nightmare. With the door now open it is time for him to wreck Havoc on the world! Exciting twists and turns make this the best issue in the series. Doom’s betrayal, Voodoo’s plan everything came together well. The art and Colors contrast lead to some truly beautiful pages and the cliffhanger ending was pure gold. Voodoo, and doom get great characterization and dialogue. Action splashed across the pages as the macabre and mystic clashed in epic form. After this Bendis kills off voodoo in a boring uneventful manner.